If ever a subject could benefit from a strong dose of perspective, it’s evolution. This important new book supplies the necessary insights by bringing together the views of leading scientists, professors, and teachers. 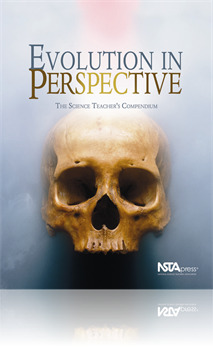 Working from the premise that only those students whose schools teach them about the nature of science will truly understand evolution, the collection gathers 12 influential articles first published in the NSTA member journal, The Science Teacher. The articles fall into three categories. The Scientific Perspective explores the evidence supporting evolution. The Educational Perspective looks at evolution’s place in the National Science Education Standards and at the thorny problem of calling evolution a “theory.” The Science Teacher’s Perspective moves into the classroom, discussing lesson plans that allow students to explore evolution and draw their own conclusions. Also included is the recently revised NSTA Position Statement on Evolution. This collection comes from, and is developed for, the people on the front lines—educators who deal with the controversy over evolution every day. From a practical standpoint, the book can help you address the subject in the classroom without being dragged into endless, ultimately unproductive debate. From a substantive standpoint, it provides a remarkable overview of the state of teaching evolution in America.